Ferns are a versatile garden plant and fern plants many varieties available for sale for garden or landscaping. This diverse group of plants are perhaps typified by the foliage which are the leaves of the fern plant. It is the way that the fronds are divided that provides the immense diversity in the world of ferns. The size of the fronds also varies from the giant fronds of tree ferns to small species a few inches tall. Ferns from from rhizomes which have an underground root system. Ferns have been an important garden and indoor plant for centuries. 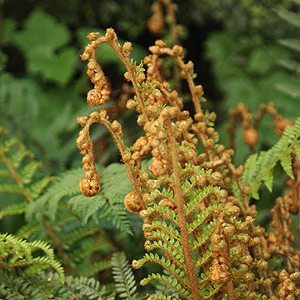 This ancient group of plants require little attention in the garden and ferns are a tough bunch once established. Ferns have no flowers petals or seeds, it is the foliage that make them so versatile. The maiden hair fern is readily available for sale and is a beautiful and delicate plant suitable for moist shady areas. To the other extreme tree ferns are large and add structure to the garden. The Cheilanthes species provides us with ferns that will cope with sunny and drier conditions. Tree Ferns – Widely found in Australia including Cyathea and Dicksonia. Tree ferns make excellent large landscaping ferns. Maidenhair Ferns – Adiantum species include a variety of Maidenhair Ferns used widely indoors. Elkhorn and Staghorn Ferns – The easier to grow of the two is the Elkhorn Fern, usually mounted of a tree fern backing. Do all ferns require the same growing conditions? Fern Nurseries, Mail Order Nurseries, Specialist Nurseries,Retail Nurseries, Wholesale Nurseries, Garden Centers, Plant Nurseries and Australian Export Nurseries. Wholesale, Retail and Mail order. Tree fern, Stag / Elkhorn and other Ferns, Orchids, Bromeliads. Wholesale, retail and exporting. We specialise in Ferns, Grass Trees, Palms, Water Plants and Water gardens. Suppliers of quality Ferns, Silver Lady, Maiden Hair, Hen & chicken fern, Island Beauty & more hardy varieties. Specialist Fern Nursery. Also selling terracotta pots, palms, seedlings, potting mix and fertilizer.